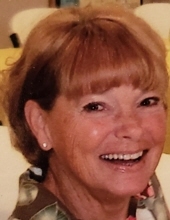 Patricia Lynn Mayes Jaynes passed away suddenly on November 12, 2018. Pat leaves behind her beloved daughters, Julia Jaynes and Ashley Hoover, son-in-law Steven Hoover, and her grandchildren, Cali, Gibson, Bella, and Killian, whom she adored, 4 sisters, a brother, and many nieces and nephews. Pat will always be remembered for her funny and eccentric personality and big heart. The family will receive friends from 6 to 7 p.m. on Friday November 16, 2018 at Ridgeview Baptist Church, with a Celebration of Life to follow at 7 p.m.
To send flowers or a remembrance gift to the family of Patricia Lynn Mayes Jaynes, please visit our Tribute Store. "Email Address" would like to share the life celebration of Patricia Lynn Mayes Jaynes. Click on the "link" to go to share a favorite memory or leave a condolence message for the family.